Unless you come to Peru by bus from Ecuador, Bolivia or Chile, your first contact with the country will be the Jorge Chavez airport in Callao and that means your first contact with taxis in Lima. As soon as you leave the customs area, vendors at the taxi booths will want to sell you a taxi ride and once you’ve left the passengers-only area, you’ll feel like in an unprotected game. Numerous taxi drivers will approach and even follow you. If your accommodation is in Miraflores, you don’t arrive late at night and don’t mind walking a little in Miraflores, ignore them and head straight to the bus stop of Airport Express Lima. (Find out more about it and other means of transport in my article about public transport in Lima.) If you that’s not a choice, continue reading and find out how to handle Peruvian taxi drivers. Well, also continue reading if you intend to use taxis while you are in Peru. NOTE: When I’m in Lima, I live in Barranco and take the Airport Bus to the Larcomar Shopping Mall. There, I grab a taxi to my apartment. That’s 20 soles for the bus (as a resident) plus 5 soles for the taxi. SECOND NOTE: If you’re not travelling alone, taking a taxi will cost you no more or even less than the bus (Airport – Miraflores/Barranco: 40 – 50 soles by taxi). Peru and especially Lima is full of taxis. Whenever I’m in Lima, I feel that every second car is a taxi. And the drivers are keen to make sure that you notice them. Means they honk all the time when they have no passengers. When you look like a tourist, they’re likely to slow down and ask you “taxi?” There are taxi companies, of course, and their vehicles often look a bit more respectable than the privately owned taxis. However, there is a huge amount of private taxis and there are cars you don’t want to take because they look as if they’d fall apart at the next corner. Taxis normally have neither a taximeter nor GPS, so unless you head to a popular destination or can give instructions to the driver, I’d recommend using a taxi app instead of just hailing a random taxi in the street. There have been reports of taxi drivers being involved in robberies and kidnapping. It may also happen to you that a taxi stops next to you and asks you for change – offering you five 10 soles banknotes in exchange for a 50 soles banknote or something like that. The other way round, it would make sense but when someone tries something like that, you can be 100% sure that you will get false 10 soles notes. So politely deny and walk on. 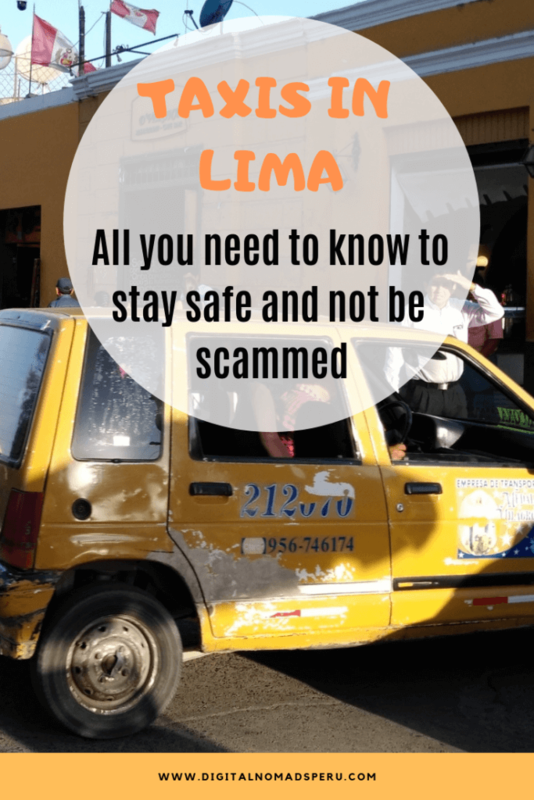 In certain areas of Lima, there’s also a risk to get robbed when the taxi is waiting at a traffic light or simply stuck in a traffic jam. Make sure to sit behind the driver, close the windows and keep your valuables next to you and on the side which is furthest away from the window. Be cautious but not paranoic. Thousands of people hail taxis in Peru every day and safely arrive at their destinations. You’re a Spanish-speaking gringo who’s more or less familiar with Peru = You’ll pay 20 – 50% more than a local. I’m in group 4 and as taxi prices in Peru are really low, I’m okay with that. I’m not at all interested in starting a fight because of 1 sol (about 30 cents). In fact, I often wonder how taxi drivers survive as there’s so much competitions and the prices are so low. So what exactly do you do when you decide to hail a taxi in the street? Important: Don’t get into the taxi before you have agreed on a price. And if you don’t find the driver or his car trustworthy, politely tell him good-bye. Ok, let’s say, a taxi stopped and you’d like to take it. The next step is to tell the driver your destination (street and neighbourhood) and wait for his offer. Write the address on a piece of paper if you don’t speak Spanish. If the price he suggests is more or less reasonable (like 10 soles for 5 km), offer 6 soles and you’re likely to end up paying 8. Or just accept the price if you’re okay with it. If he comes up with a price like 30 soles for 5 km, it’s best to decline at once. If the driver seems to be uncertain about how to get to your destination, better wait for another taxi unless you’re sure you can give good instructions. If you’re in a group, it makes sense to make it clear that the price is for the car and not per person. Make sure, too that the price in soles and not in dollars. Well, mainly airport taxi drivers will try this scam, once you’re in Lima, you don’t have to worry much about it anymore. Well, and always look and act confident when dealing with taxi drivers. No reason to be rude, though. Despite their bad reputation (and the often horrible way they drive), I’ve found most taxi drivers in Lima to be pretty normal and reasonably friendly people. If you don’t feel fine with hailing a taxi in the street, EasyTaxi, TaxiBeat, Cabify or Uber are options. EasyTaxi seems to have the best reputation and is the app I use when I decide not to hail a random taxi. I’ve heard people complaining about Uber drivers who did not end the journey correctly and therefore, the passengers were charged more. Personally, I’ve never used Uber and never will because I don’t agree with the company’s ethics but that’s another story. 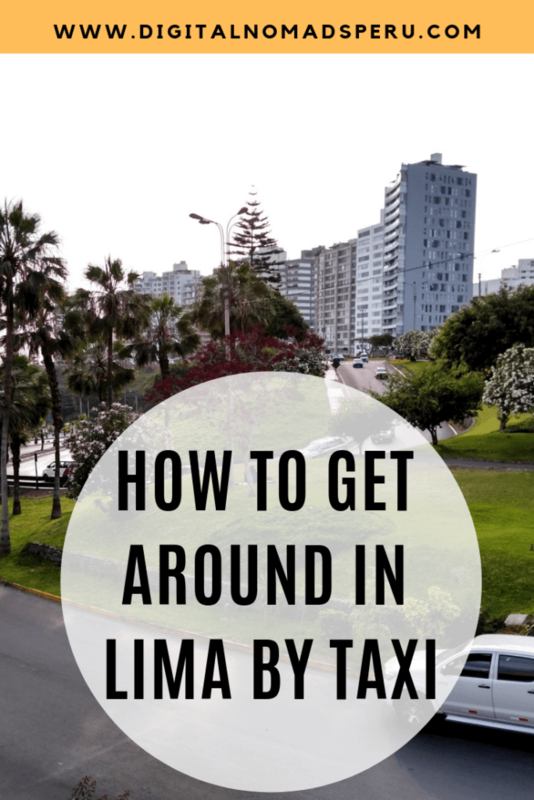 Please note that taxis which operate in Lima are usually not allowed to do so in Callao which is where the airport is located. I haven’t taken a taxi from or to the airport for ages but TaxiBeat seems to be the only app which works when you arrive at the airport. Taxis you hail in the street will often risk it to take you to Callao but won’t enter the parking lot of the airport. They will drop you off in front of it which is no problem unless you have a lot of luggage. Especially in the richer neighbourhoods, it’s absolutely common to take a taxi. You will often see people jump in a taxi once they ‘ve finished shopping at the supermarket. There are expats and also locals who never use public transport. And there are expats and tourists who never hail a taxi in the street. Your choice. I already took taxis in Latin America in pre-internet times which may be a reason why I’m more comfortable with it. During rush hour, neither a taxi nor a bus is a good option. At 8 am or 6 pm, Metropolitano, Lima’s rapid bus system which has their own lanes, is your best option as far as speed is concerned but at the same time a nightmare because it’s crammed with passengers and you’ll have more unsolicited body contact than you ever wished for. Apart from that, it already happened to me that two Metropolitano buses arrived, it was not possible to get in and I had to wait for the third one. So when you’re in a hurry, a taxi is a better option. However, your best option is to avoid travelling during the rush hour. Personally, I prefer to walk the 3km to Barranco when I’m in Miraflores in the late afternoon. Try taxis and try public transport and then stick to what you feel more comfortable with it or use either one according to your needs.